The perfect oil for the long-term preservation of bare metallic parts, even in extreme conditions (-50°C up to 100°C). This oil creeps between metal and moisture, infiltrates hairline cracks, cleans, keeps surfaces smooth, does not get sticky or resinify either. Gunex is free from silicone, chlorinated hydrocarbon and ozone-damaging CFCs. Perfect protection in all climate zones – including the tropics! With Gunex, everything stays protected against rust even in wet conditions! 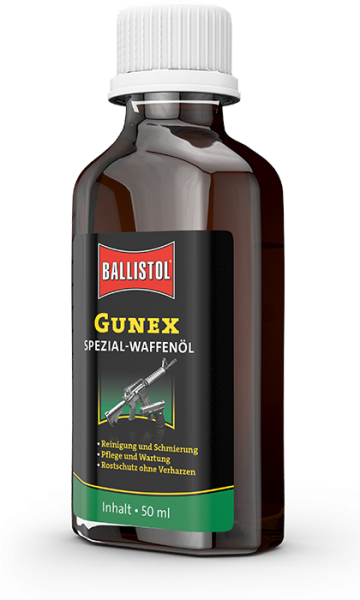 Removes powder and tombac residues, ensures that the complete mechanisms of rifles, pistols and revolvers run smoothly; cares and protects. Resins of unsuitable oils are dissolved. Also suitable for the care of fishing rods, telescopic pull-outs and barrels. Protects and cares for moving components, shiny metals, screw joints and traction systems, also against salty air and splash water. Ideal for the treatment of squeaking, creaking or tight joints. Prevents the freezing of locks, loosens resinous dirt and tar, and provides metal and chrome parts long term protection against corrosion. Keeps battery, distributor and ignition coil contacts clean, eliminates damp, and prevents the penetration of creeping water. Gunex also reliably functions as chain oil for motorcycles.